CM Palaniswami wrote to PM Modi stating that if the coal supply position is not improved immediately, some of the thermal power stations will have to be shut down leading to power outages. Tamil Nadu Chief Minister Edappadi Palaniswami has written to Prime Minister Narendra Modi asking him take steps to ensure that the coal supply to Tamil Nadu meet the requirements of the state. 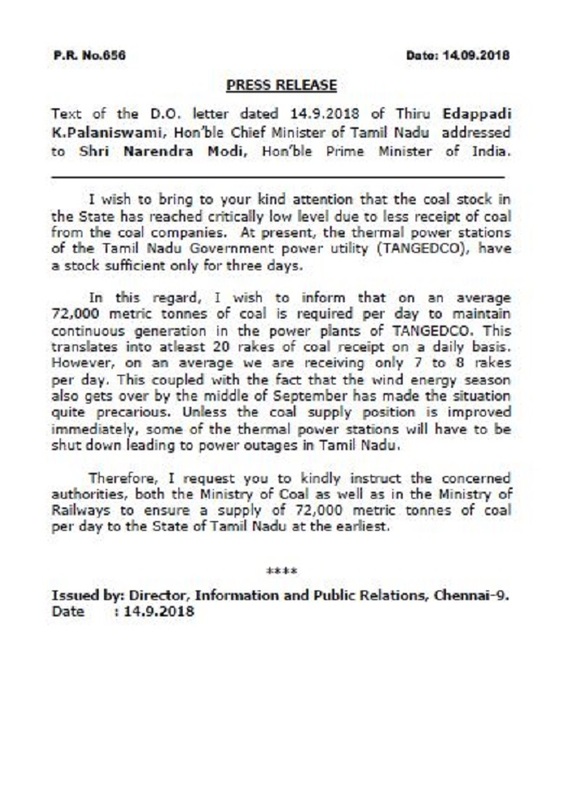 In his letter, the CM has said that the daily coal supply required by Tamil Nadu to meet the power requirements is 20 rakes of coal and that the current supply is at an average of seven to eight rakes per day. The decrease in wind energy output also contributes to the dangerous situation at hand, the letter said. The CM’s letter stated that the coal stock in the state has reached a critical level and will be sufficient to generate power only for three more days. “Unless the coal supply position is improved immediately, some of the thermal power stations will have to be shut down leading to power outages in Tamil Nadu… Therefore, I request you to kindly instruct the concerned authorities, both the Ministry of Coal as well as in the Ministry of Railways to ensure a supply of 72,000 metric tonnes of coal per day to the State of Tamil Nadu at the earliest,” the letter added. Recently, following allegations by the Leader of the Opposition and DMK President MK Stalin, the Tamil Nadu Electricity Minister P Thangamani issued a statement to the press claiming that there were no power outages in the state. He also stated that the power demand in the state is met through hydro, thermal and gas shares in addition to solar and wind generation. His response was to a tweet by MK Stalin where the latter accused the state government of not being able to handle the demand for electricity. “It was shocking that there are unscheduled power cuts all across Tamil Nadu in the name of 'maintenance' or 'fault' when the government is unable to handle the demand for electricity. This directly affects people from all walks of life. It is unacceptable that people are affected by the government's maladministration,” read Stalin’s tweet. Adding that reliable power supply was being provided to ‘all categories of consumers’ through state-owned thermal and hydro stations as well as power purchase from the open market, the minister said that The Southern Regional Power Committee of the Central Electricity Authority (CEA) in its Load Generation Balance Report (LGBR) has stated that Tamil Nadu will continue to be a power surplus State in the year 2018-19.